Beauty Outfits There are 9 products. 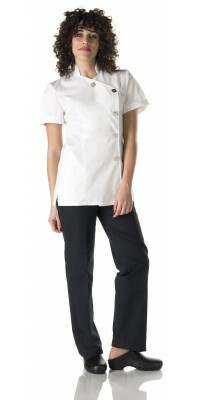 Corbara’S Professional Wear: Beauty Outfits for Wellness Centres and SPA. This series of Professional Wear, suitable for the staff of a hotel’s wellness centre and SPA, is made of a very lightweight and breathable fabric called Soft-Feel Gabardine: a cotton blend (50% cot. 50% pol.) fabric that ensures great comfort and, at the same time, a long duration and bright colours after many washes too. In this category, we propose the Rubia Tunic in black with white colour profiles on collar, sleeves and pockets, and the Noemi Tunic, with side buttoning, a practical comfort pleat on the back and a fold on the sleeves, available in white and black colour. Both tunics can be matched with the Lisitea Trousers, a very practical and comfortable model with adjustable waist that can be used in the same colour of the tunic or in a contrasting one; in fact, there are two colours available: black and white, which can be matched as you want. Lastly, for those who prefer the kimono jacket, we propose the Aiko Kimono Tunic, with the typical the cross fastening, without buttons; even this tunic matched once again with the Lisitea Trousers. There are two colours available for this outfit: Light Grey and Brown. Women's short-sleeved tunic, model RubiaBlack with white profilesImmediately available for delivery: sizes from XS to XL Made of Lightweight Soft-Feel Gabardine, 50% Cot., 50% Pol. Short-sleeved White tunic, model Noemi pleat on the back with micromesh bandsleeves with snap fastener and micromesh bandImmediately available for delivery: sizes from XS to XL Made of Lightweight Soft-Feel Gabardine, 50% Cot., 50% Pol. Short-sleeved Black tunic, model Noemi pleat on the back with micromesh bandsleeves with snap fastener and micromesh bandImmediately available for delivery: sizes from XS to XL Made of Lightweight Soft-Feel Gabardine, 50% Cot., 50% Pol. Women's trousers, model Lisitea Adjustable waist - side zipperBlack colourImmediately available for delivery: sizes from S to XL Made of Lightweight Soft-Feel Gabardine, 50% Cot., 50% Pol. Short-sleeved kimono-shaped tunic, model Aiko side, crossed fastening Light Grey colourImmediately available for delivery: sizes from XS to XL Made of Lightweight Soft-Feel Gabardine, 50% Cot., 50% Pol. Women's trousers, model Lisitea Adjustable waist - side zipperLight Grey colourImmediately available for delivery: sizes from S to XL Made of Lightweight Soft-Feel Gabardine, 50% Cot., 50% Pol. Short-sleeved kimono-shaped tunic, model Aiko side, crossed fastening Brown colourImmediately available for delivery: sizes from XS to XL Made of Lightweight Soft-Feel Gabardine, 50% Cot., 50% Pol. Women's trousers, model Lisitea Adjustable waist - side zipperBrown colourImmediately available for delivery: sizes from S to XL Made of Lightweight Soft-Feel Gabardine, 50% Cot., 50% Pol.